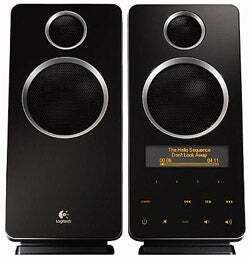 If you're looking for a pair of 2.1 USB speakers without the .1, the Logitech Z10 Interactive Speakers should do fine. Thanks to the woofers mounted on the back of the satellites, the pair replicate bass well enough for people who don't want to get cardiac arrhythmia every time they listen to a Snoop track. The sound was a bit flat, but the reviewers preferred it that way. The main draw, however, is the 160x43 LCD display on the right speaker. The same LCD that's on the Logitech G15 Gaming Keyboard gives you "current track information, your latest POP3 emails, the time and date, your current CPU and RAM utilization, a countdown timer, and a stopwatch." There are also a bunch of mods for the G15 LCD, where you can find on the mod websites below. Logitech, has finally gotten on the ball and released a keyboard tailored to the computer gamer. There's also support for all the major media players—probably not the Zune—and you can even set radio favorites on the thing. You'll most likely be using the touch-sensitive buttons that control standard playback, volume, and power controls more, and they're definitely slick looking. 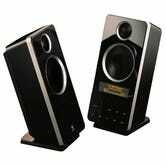 They're $149 on Amazon, which isn't bad but a bit more than the older Logitech Z-2300s that come with a sub.